After my fist-pumping-the-air-in-my-living-room celebration for doing 40 push ups in a row, I decided I needed some sort of master plan to get to my goal of 50. Some kind of routine (because I’m a sucker for routine). After creeping on loads of other fitness blogs this 100 Push Ups Challenge kept reappearing so I decided to check it out. And it looks alright! 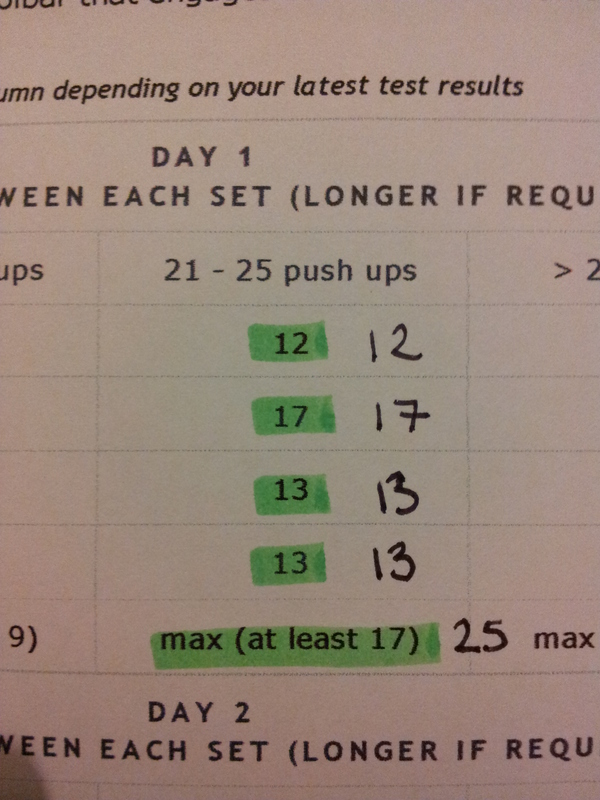 I mean, I probably wont be able to bust 100 push ups out in one go, but it’s definitely a step in the right direction. You know, up. So I decided to start on Week 3, middle column. Day One: Demolished! This entry was posted in Goals, Training and tagged 100 push ups, fitness, training by MedalSlut. Bookmark the permalink.